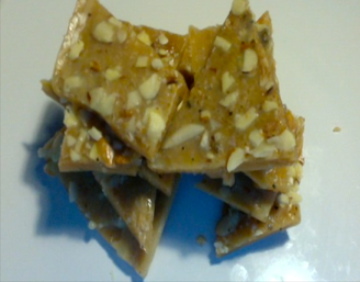 Almond Besan Burfi is an easy to make delicious festival sweet. 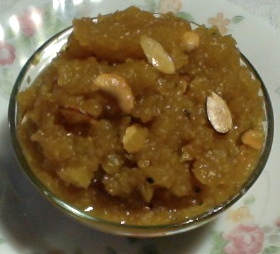 And I made it with jaggery to avoid white sugar. Make this sweet for any festival like Holi, Sankranthi or Diwali. 1 tbsp toasted and crushed almonds or pistachio or cashew for garnishing. Apply some ghee to a pan and keep it aside. Toast the almond slices and crush them coarsely. Heat a thick bottom pan on medium heat. Once the pan is hot bring it down to low medium. Take the ghee in the pan and keep 1 tsp to add at the end. Add besan to ghee and fry on low medium. Keep stirring for 5-7 minutes until you have a nice aroma. After 2-3 minutes add almond flour and continue frying. Add jaggery when the besan is giving nice aroma and before it changes the color. Add 2-4 tbsp of water also to jaggery. Mix them well and keep stirring for 2-3 minutes. You will notice that the mixture is getting thick. Add the remaining 1 tsp of ghee and stir. Add cardamom powder, turn off the stove and mix it well. Transfer this mixture into the greased pan and press it down. Smoothen the surface with the back of the spoon with a little ghee on it. Sprinkle the crushed almonds and press them slightly. Let it cool down for 30-60 minutes. 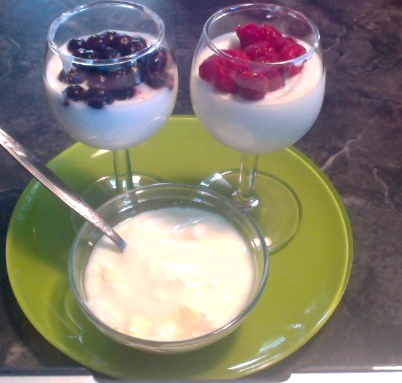 Cut them into your desired shape like diamonds or squares. Keep them in an air tight container for a week. Keep stirring and control the flame other wise your besan will get brown quickly. Apply a little ghee to the knife to cut smoothly. 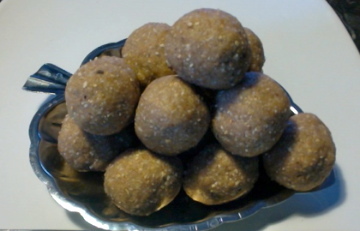 This is a good festival recipe that you can make for Navaratri, Holi, Diwali or Sankranthi. The original recipe calls for white sugar. 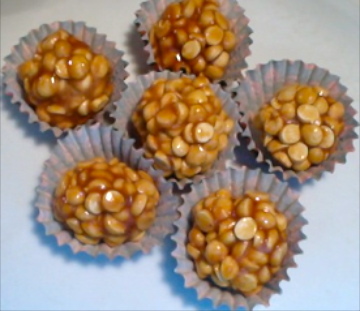 But I made with jaggery because it is a better choice. Eat them moderately because the besan may cause indigestion for kids.